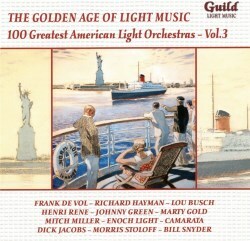 This is the third volume in Guild’s collection of music by America’s greatest light orchestras (see reviews of Volume 1 and Volume 2), and they have assembled an entertaining selection of tunes by some of America’s finest. One of my favorite numbers here is Lisbon Antigua, a Portuguese folk song written in 1937, and made popular by Nelson Riddle in 1956. Don Costa and His Orchestra recorded their version for United Artists in 1961, and it features a beautiful guitar introduction and full string accompaniment. Kermit Leslie and his brother Walter wrote the charming tune Champagne, which was originally recorded in 1956 on the Epic label. Kermit’s orchestra performs the song with style and finesse, and the sounds of popping corks and the bubbly pouring add a nice touch. Richard Hayman’s orchestra performs an outstanding rendition of the Latin tune Rhapsodero, composed by Bernie Wayne and originally recorded on the Mercury label in 1958. The seven minute song features several beautiful guitar and trumpet solos and a sweeping epic melody. Otto Cesana composed the lively tune Hey Professor! for a 1958 Columbia Records album, and his orchestra has a fine time swinging through it with some interesting percussion and honky-tonk piano effects. The talented Tutti Camarata was the co-founder and musical director for Disneyland Records. In 1957 his orchestra recorded the Victor Young tune The Silver Tree for the Disneyland “White” album. It is a beautiful number with several parts; the first begins with a trumpet call, followed by a joyous sleigh ride highlighted by tinkling bells. The slower bridge section captures the beauty of a winter day with a thoughtful musical meditation, followed by a return to the original sleigh ride melody. Another example of fine song writing is the Alec Wilder tune I’ll Be Around, recorded by George Bassman and His Orchestra in 1953 on the MGM label. The arrangement is excellent, with several key changes and the verses alternately led by the strings and the brass section. Alan Bunting was responsible for compilation, remastering and audio restoration. The final master preparation was accomplished by Reynolds Mastering, Colchester, England. A very informative 12 page booklet is included with the disc, with comments by Tony Clayden. The sound quality of the disc is good. Overall a very nice addition to the series.